You cannot go wrong with any of our systems, but before you buy from the competition, you need to know that our systems beat them in every category. 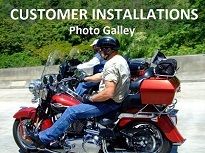 Built in Abilene, Texas since 1999, Motorcycle Tunes puts our customers first. We are the ONLY company with a lifetime warranty. We SMASH the competition, but people often want narrow their choices down and compare us side by side and see exactly how we measure us to them. Motorcycle Tunes was founded in 1999, and Steel Horse Audio was founded in 2017 as they took over the sales of Uniq Cycle Sounds. In fact, Uniq Cycle Sounds purchased from us and resold our speakers before they started making their own systems. For an accurate comparision, we picked our Platinum System against their Platinum System. Steel Horse Audio claims their Platinum Speaker System to be 900watts plus, but Rockford Fosgate has the amplifier rated at 600 Watts MAX and that is only 100 Watts per speaker RMS. Our 1000 Watt Amplified Speakers with Bluetooth features a Cerwin Vega amplifier is rated at 400 Watts RMS, and is 200 watts RMS per speaker. So our system gives 100 watts more of actual RMS power to each speaker than Steel Horse's system. We don't know them personally, but we do know every component they use in their systems, and if you want less power, lower volume, an amplifier that is well known for overheating, and to pay more, then they may have just what you are looking for. We've been in business 18 years longer than them, our systems are MORE POWERFUL, LOUDER, AND Better in every way, plus LOWER Priced than Steel Horse. We SMASH them in every possbile category. Disclaimer. The above information was derived from the website of Steel Horse Audio, Polk Audio, Cerwin Vega, Kicker, Rockford Fosgate. We are not associated with these companies and the information for comparison purposes only.